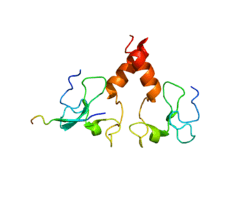 PHD finger protein 21A is a protein that in humans is encoded by the PHF21A gene. 1 2 3 4 5 Hakimi MA, Bochar DA, Chenoweth J, Lane WS, Mandel G, Shiekhattar R (May 2002). "A core-BRAF35 complex containing histone deacetylase mediates repression of neuronal-specific genes". Proc. Natl. Acad. Sci. U.S.A. 99 (11): 7420–5. doi:10.1073/pnas.112008599. PMC 124246 . PMID 12032298. 1 2 "Entrez Gene: PHF21A PHD finger protein 21A". 1 2 3 4 Iwase S, Januma A, Miyamoto K, Shono N, Honda A, Yanagisawa J, Baba T (Sep 2004). "Characterization of BHC80 in BRAF-HDAC complex, involved in neuron-specific gene repression". Biochem. Biophys. Res. Commun. 322 (2): 601–8. doi:10.1016/j.bbrc.2004.07.163. PMID 15325272. ↑ Hakimi MA, Dong Y, Lane WS, Speicher DW, Shiekhattar R (Feb 2003). "A candidate X-linked mental retardation gene is a component of a new family of histone deacetylase-containing complexes". J. Biol. Chem. 278 (9): 7234–9. doi:10.1074/jbc.M208992200. PMID 12493763. Hailesellasse Sene K, Porter CJ, Palidwor G, Perez-Iratxeta C, Muro EM, Campbell PA, Rudnicki MA, Andrade-Navarro MA (2007). "Gene function in early mouse embryonic stem cell differentiation". BMC Genomics. 8: 85. doi:10.1186/1471-2164-8-85. PMC 1851713 . PMID 17394647.